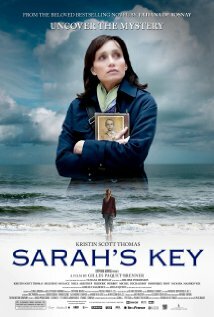 The Weinstein Company releases Sarah's Key at the Paris Theatre and Angelika Film Center on July 22nd, 2011. Gilles Paquet-Brenner: I tried to focus mainly on the plot and the caracters, so that it could be a movie, not a history lesson. But what you see on screen is for the most part chocking, and you end up leaving the theatre thinking a lot about it, which is in my opinion the most important thing about this kind of films. It has an emotional impact that provoke thoughts. NYC MOVIE GURU: What do you think are the basic elements that turn a drama into a classic? What are some examples of those classics? GPB: I don't know, but a film becomes a classic when it lasts. 10, 15 years after the theatrical release, you know if a movie is really worth it. Any Kubrick movie is a classic. NYC MOVIE GURU: How challenging was it to balance the heavy subject matter with the right amount of levity? Quite challenging, and some would argue that you can't do this with such a heavy subject matter. I don't agree, life is made of darkness and light, in any situation. But you must be true to what you depict on screen. 1942 is for the most part harrowing, 2009 is obviously pale in comparison, but that's the all point of the movie. Some people in our western world think they have problems, and they do. But sometimes, it is good to remind them that other people have/had real problems. You need perspective to really understand and process a situation. The levity also makes the movie accessible. NYC MOVIE GURU: What was the process like to find the right young actress to play Sarah? It was actually very easy, because François Ozon discovered her before me. She was in his movie "Ricky" when she was seven years old. And you could see imediately she was special. It was a great chance, because without Melusine, there would have been no movie. NYC MOVIE GURU: How often did you meet with Tatiana? What kind of questions did you have for her or what kind of discussions? We met quite a lot, because we became good friends, and we never really talked about the adaptation. She trusted me. But I asked her about her research - she used to be a journalist - on the subject, so I could use it for my own research. It was very helpful. She also put me in contact with Vel d'Hiv survivors. What matters the most in that scene is the reaction of those who discover the body. You can read the horror on their faces, and you understand that this is going to haunt them for the rest of their lives. It is more effective and ethic than a horror movie shot. NYC MOVIE GURU: How important and/or challenging for you was it to get a PG-13 rating? The movie is french, we don't have the same rating's system and it never even crossed my mind. The PG-13 rating just happened. The studio and I never talked about it, I guess everybody kind of expected an R. Anyway, I can't imagine twelve year olds going to see the movie by themselves, they have other interests. Children and teenagers will go with their parents and grandparents, or maybe with their teachers, so they can give them explanations, and this is the way it slould be. NYC MOVIE GURU: When and how did you first learn about the Holocaust? At what age do you think it's appropriate to learn about it? I learned about it quite young, because I lost part of my family in the camps and my grandmother would talk about it. I am not the right person to tell, but I guess you should not see images before you are 11/12 years old. I remember watching "Night and Fog" on french TV when I was a kid. Once you have seen these images, you never forget them. NYC MOVIE GURU: How would explain the Holocaust to a child without resorting to euphemisms while not scaring them away? I would try to explain the historical context first - economic crisis in the thirties, rise of fascism - so they don't see this as a horror story with boogie men, and so they can understand it is the result of something else. It is not only about knowing the Holocaust, it is about understanding why it happened. Then I would try to give exemples, not the most horrible ones, because children need to relate to something they can understand. NYC MOVIE GURU: What reply to William Rainsferd if he asked you for advice about how to cope with his grief? Do you think he would be able to overcome it more easily had he learned about the tragic truth as a teenager? How have you overcome/coped with grief in your own life? He would probably have been a troubled teenager, had he known the truth about his mother's suicide. So he was protected in a way, but knowing this so late in his life makes him feel betrayed. I have no advice. Facts are facts, and you have to deal with them, whether you like it or not. Maybe I would tell him to try to understand what his mother went through. As a grown up, experienced man, he could probably understand that. There is nothing comparable with my personal situation. I lost relatives in times of war, like millions of families around the world, and it happened before I was born. It was way harder for my mother. She lost her father when she was two and you never recover from that.